I always have a tough time deciding when to take trips out of town. There is always something awesome going on. If you haven’t noticed, Virginia craft beer is better than it has ever been and shows no signs of slowing down. Sometimes you just need to get away so I’ll be off to Washington, DC to check out Bluejacket and their restaurant, The Arsenal. While I’m doing that, I’m going to need you to fill in for me at some events this weekend. COTU is throwing a three day party to celebrate one year of great beer in Ashland. This all starts tonight Friday, November 15th at 4pm with the return of The Richard Imperial IPA. Originally released at their grand opening, Richard was the happy accident of COTU’s first brew on their system. A little off here, short some water there, and they were left with a double IPA very similar to Pocahoptas, but much stronger. COTU will also be tapping some “Barrel Aged wonders,” barrel-aged versions of a selection of COTU beers. Something Shiny will provide live music for the evening. 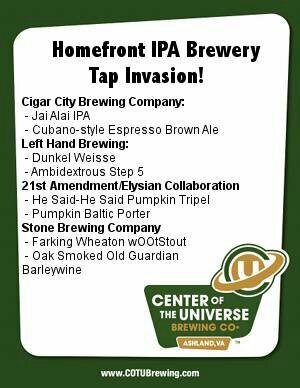 Saturday, the celebration resumes at 3pm with guest taps from Homefront IPA collaborating breweries. Left Hand, Cigar City, 21st Amendment, and Stone have provided 2 kegs of limited release beers. Enjoy music from The Hippy House Band and Chuck County. Sunday, the party continues with music from The Royal We. and growler fills of all remaining guest taps. Football fans can enjoy the Redskins/Eagles game on COTU’s 22 foot screen in the back. Center of the Universe Brewing Company opened its doors in Ashland, VA on November 16th 2012. Brothers Phil and Chris Ray, who started as homebrewers turned their hobby into an obsession that is now a successful brewery in Virginia. Hardywood is releasing Gingerbread Stout Saturday November 16th at 2pm but the night before Mekong is hosting a pre-release party with some Hardywood beers that haven’t been seen in awhile. If you’re looking to skip the lines during the party, Hardywood will be open 9 – 10:30PM Friday night for a pre-sale event for bottles (4 bottle/person limit) and other seasonal merchandise. The lines will be cut off at 10:30, and there will be no on-site consumption. The main party runs from 2 – 9PM with Gingerbread Stout available in 6oz and 12oz pours. Samson Trinh & The Upper East Side Big Band (really hate I’ll miss them; check out their Abbey Road Project) and Zep Replica will play sets at 4 and 7pm respectively. Enjoy Boka Tako Truck, Pizza Tonight, Estes Bar.B.’Que, Mosaic, Station 2, Thai cabin, Olio Cart VCU, The Official Gelati Celesti Ice Cream Makers and a cart from Phoenix Garden Vegetarian Restaurant all day! LCCB is releasing the last pumpkin beer of the season Saturday, November 16th during a farm festival from 11AM to 8PM. Pumpkin Ain’t Easy features sugar pie pumpkins grown on LCCB’s farm. LCCB chose to omit the typical pumpkin pie spices in favor of their Belgian house yeast strain and German Tettnang and Hersbrucker hops. The festival will feature a farmer’s market, artisan crafts (blacksmiths & gunsmiths), and children activities(bounce houses, a petting zoo, pony rides). Music will be provided by the ReVinyls, Barrelhouse, and Cashmere Jungle Lords. Advance Purchase Only Brew Fest Ticket: $20 (Plus Fees) Good for entry to the vent, four 15 oz beer pours, an LCCB pint glass, access to farm and craft vendors, music, and activities. Discounted Brew Fest Tickets are only available online in advance. You must be 21 years of age or older to buy a this ticket. One ticket per person. 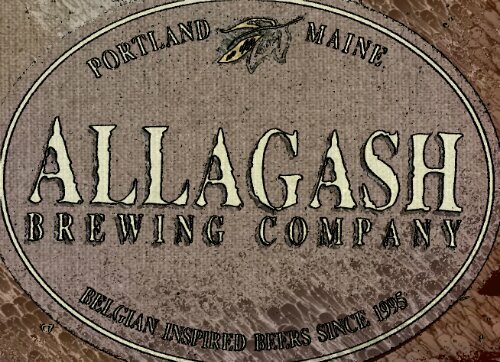 Head over to Brew in Chesterfield today, Wednesday November 13th for their Allagash Brewing tap takeover which will include some rare and vintage kegs. You can steal a cool Allagash chalice with any Allagash beer or flight. Les Addis from Allagash wll be joining the fun talking all things Allagash so bring your questions. Brew will also be raffling off a very special beer from Allagash’s coolship series to benefit St. Jude Children’s Hospital. UPDATE: Taplist has increased to ten beers below. Brew will be holding raffle at 7pm for a bottle of Resurgam. Head over to the Facebook event for more details. Popped into Saison a couple times over the weekend so I could get the details on their beer cocktails for the week. The list sounds amazing and I’m looking forward to trying more of their creations. End of Days ($8) — tequila, campari, lime, demerara, IPA. Imperial Dark & Stormy ($10) — Rum, lime, ginger, ginger beer, imperial stout. Death Star Flip ($10) — Rum, bourbon, orgeat, Imperial stout. Apple Jackie Brown ($10) — applejack, apple port, sherry, Averna, Belgian Brown. Pils Punch ($8) — Gin, St germain, lemon, pils. 3-2-1 Contact ($8) — dry vermouth, rose vermouth, allspice dram, Aperol, Wild Ale. Rumbarrelstiltsken ($10) — Rum, Madeira, barleywine. Go check these guys out and grab some of their delicious food while you’re at it. We’re only a few days into this marathon we call RVA Beer Week but tonight is when the real fun begins. Coincidentially, tonight is also the night to have multiple events in many locations where choosing one over the other may seem like losing. I assure you though there are no losers during this week. Hell, you can join in at home just by popping open a bottle you have been saving from your favorite local shop. I had forgotten but today Saturday November 2nd is National Teach a Friend to Homebrew Day. 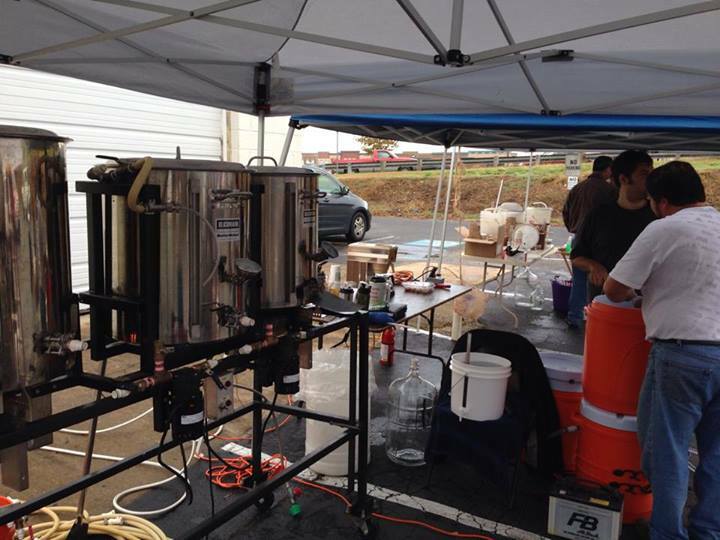 Head down to the Weekend Brew in Chester for their annual clusterbrew going on right now. So head down and check out the action with the James River Homebrewers. Been homebrewing for awhile now? Want to learn to can? 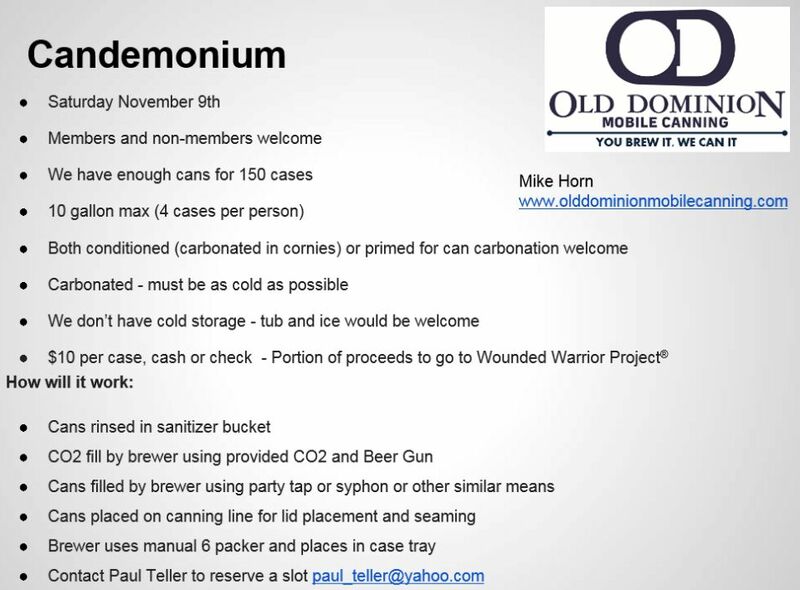 James River Homebrewers and Old Dominion Mobile Canning have teamed up to present Candemonium next Saturday November 9th. To reserve a spot contact Paul Teller at paul_teller@yahoo.com.